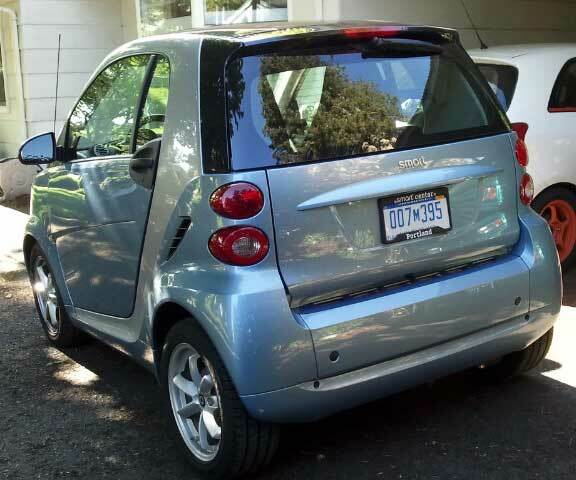 Upon its introduction to the U.S. market in 2008, the Smart ForTwo made some big waves for such a diminutive car. 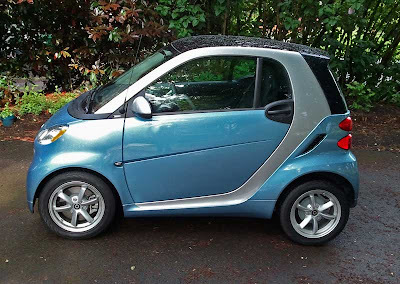 Things have calmed down a bit, but Smart hopes to churn things up with a few changes to the 2011 model, including more airbags, LED daytime running lights, and added interior storage space. 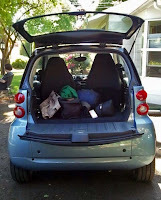 My test model was the upper-end 2011 ForTwo Passion Coupe, which stickered at just over $16,500. Once you get next to the car you realize how small the ForTwo’s dimensions really are—a handy trait when running around an urban area, or trying to fit into a tight parking space. After all, at its core, this is what the ForTwo is about. Most of the body panels are plastic, with the exception of the safety cell. And yes, the Smart is loaded with eight airbags, the aforementioned safety cell, stability control, EBD, ABS, CBC, BAS, and all those other keep-you-safe acronyms. The car even scored 4 out of 5 stars in the NHSTA crash test. 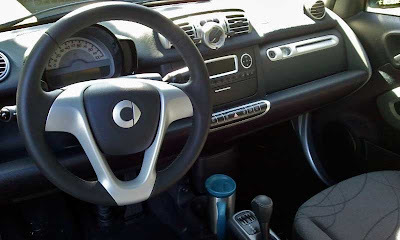 The inside of the ForTwo is definitely different. It feels utilitarian and somewhat go-kart like, even down to the accelerator and brake pedals. It has a great fat, chunky steering wheel, firm seats, and an easy-to-read compact gauge cluster. The clear plastic panoramic roof has a retractable sun shade for a very airy feel. Interior material quality seems a bit under par with other $16,500 vehicles these days, as some items, such as the climate control and center console, feels plasticy. And, unfortunately, while I had the car, the climate control’s fan stopped working—probably a blown fuse. The car had a sound system that included a USB and auxiliary jack, but no CD player. Sound was a bit underwhelming. 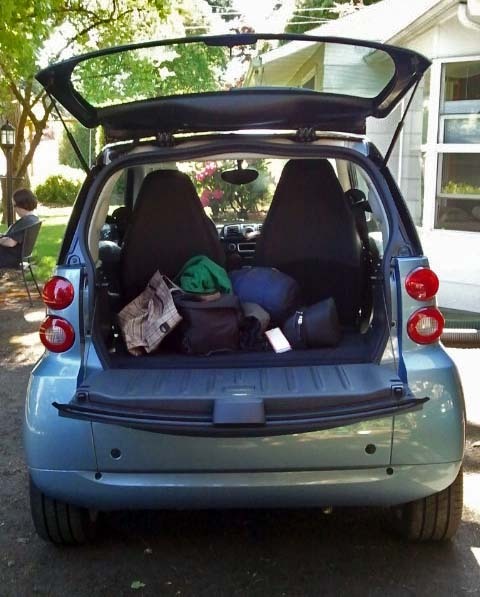 Interior space is understandably compact, as is cargo capacity. I could get a few things behind the seats, such as a duffel bag or a couple of backpacks. There a several cubbies for stashing stuff and a couple of center-console-mounted cupholders. 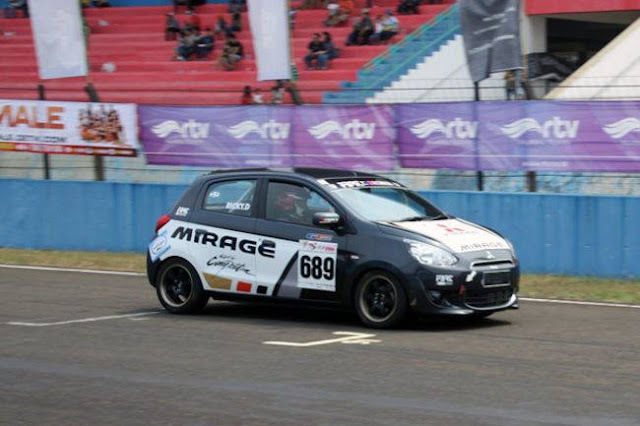 The car is powered by a rear-mounted 1.0-liter 70 horsepower three-cylinder engine making 68 ft./lbs. of torque put down to the rear wheels. Although this doesn’t sound that impressive, consider the fact that the vehicle only weighs around 1,800 lbs. This power is put through a unique five-speed automated manual transmission. No clutch to depress, no need to move a shifter through the gates (although there is a manual mode). Driving the ForTwo, much like the rest of the vehicle, is a unique experience. Unfortunately, the experience is hampered by the transmission’s performance, which is slow to shift. From a standstill, the car takes off fine. However, when it comes time to shift, there’s a noticeable delay, and the engagement isn’t very smooth. This gets exaggerated when you attempt to drive the ForTwo spiritedly. The engine builds revs quickly in first gear, and even sounds like a sports car at higher revs. To be honest, first gear is a lot of fun to wind out in manual mode (it could be called go-kart mode!). But when it comes time to shift, the transmission doesn’t allow the engine to hold its revs, and the power—and fun—drops off. The car is EPA rated at 33 MPG city, 41 highway, 36 combined, and somewhat oddly, requires premium fuel. From such a small car, I expected a bit more MPGs, especially considering there are larger and less expensive cars getting 40 MPG on the highway. You will have to move to a hybrid to get this kind of city fuel rating. In the handling department the Smart is a great runabout. The steering is tight and precise, and that fat steering wheels is great. The car has 15” tires and alloy wheels (with only three lug nuts per wheel), and everyday handling is good. When pushed, the ForTwo’s traction control kicks in quickly so as not to upset the car, and to keep everything under control. Hey, it’s not a sports car, it’s a city car. 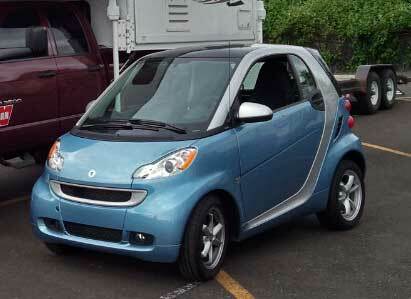 Speaking of, the ForTwo is a cinch to park. It takes a bit of getting used to though; there isn’t much in front or behind you, so when parallel parking I was either two feet away from the curb or up on it. Once you get the hang of it, it’s great (as is the minuscule turning radius). I found the ForTwo to be a surprising on the highway, too. It tracks straight, keeps up with 60 mph traffic easily, and feels solid and composed at speed. The combination of low horsepower and the somewhat uncooperative transmission does not allow strong passing ability from highway speeds, though. The other thing to be weary of is crosswind, which easily tosses the tiny coupe across the lane. Overall, this car is a mixed bag for me. I like its size, its simplicity, and its maneuverability. I feel it’s a bit too expensive, don’t like that it requires premium fuel, and dislike the transmission’s performance. If this car had a manual transmission available—even a CVT—it would transform the car’s personality. The company has some increasingly stiff competition in the subcompact market from larger, less expensive-competitors. 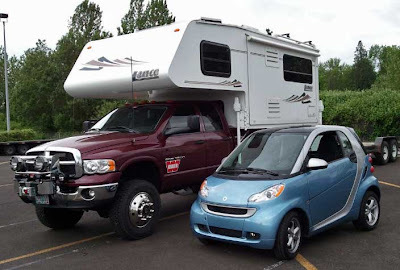 Other manufactures are soon to get in the micro-compact market, and that could mean a fierce fight for some tiny territory. 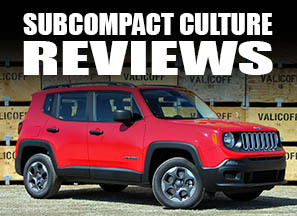 Every review is unanimous: the high price and the poor transmission performance just kill this car's appeal. Fixing these two issues (instead of simply adding gimmicky LED DRLs) might actually earn some buyers. Once you learn to work with the manual mode, the transmission is not an issue. Agreed the price is about 1500 too high, but it seems lately the incentives have been taking care of that.